Taste characteristics: This is another great tea produced by Denong Tea Factory. 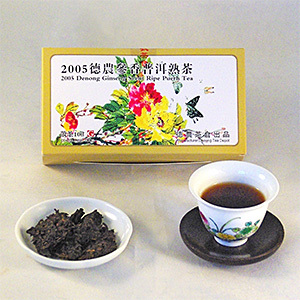 Broken from compressed tea cakes, this ripe Pu-erh is thick, brothy and savory. It finishes with a cooling sensation in your mouth that is similar to that left after having drunk Ginseng soup. The chest warming sensation is pleasant and relaxing. An excellent quality ripe Pu-erh for a great price! Bana Tea Company is proud to be able to offer it to Pu-erh ethusiasts.